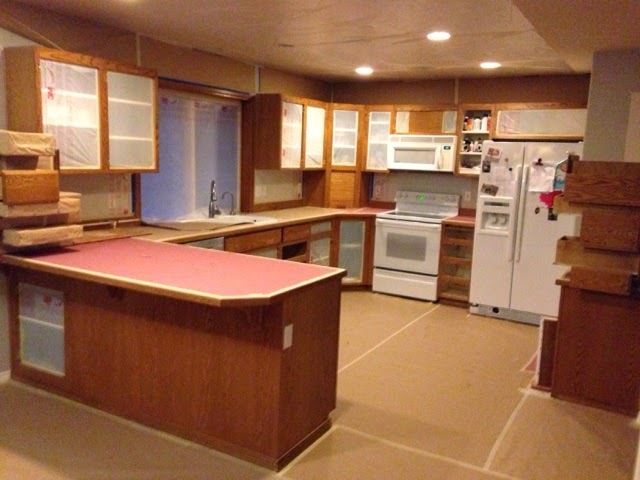 We are by no means done with our kitchen renovation, but I'm praying that it's soon to be my favorite room in the house....so I'm sharing it for today's post in Andrea's "Show and Tell" series. 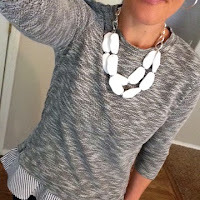 I've been pinning 23479238 pins with design ideas, and I'm excited to share them with you! 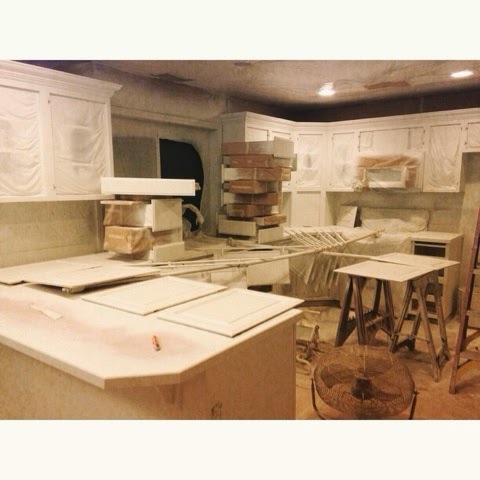 And if you need a reminder of what our kitchen looks like, mid-renovation, feast your eyes. Not stressful or anything! ;-) I mean, who needs cups, plates, utensils, or pretty much anything! 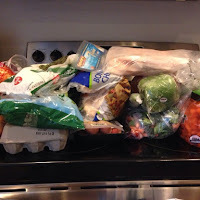 With four kids, this has been a huge challenge. 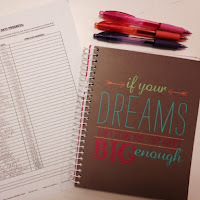 The "it will be worth it" mantra, is what keeps me going!! Here's where we are at, as of today.....we've made major progress, but still have a ways to go! I have a million ideas running around in my mind and I'll post some of them on here. Please let me know what you think, or send more my way!! It's funny how I can picture the kitchen of my dreams, but putting it all together and picking out all the pieces is so hard!! I am really happy that we decided to go with white, and that's mostly impart to the awesome advice from all of you! I think there were at least 40 people who replied to my post about cabinet color and all but 2 (I think) said to go with white. So, white it is! I'm picturing airy and fresh, clean and contemporary. I don't want it to be kitch-y or cottage-y and am looking for more of a timeless look. 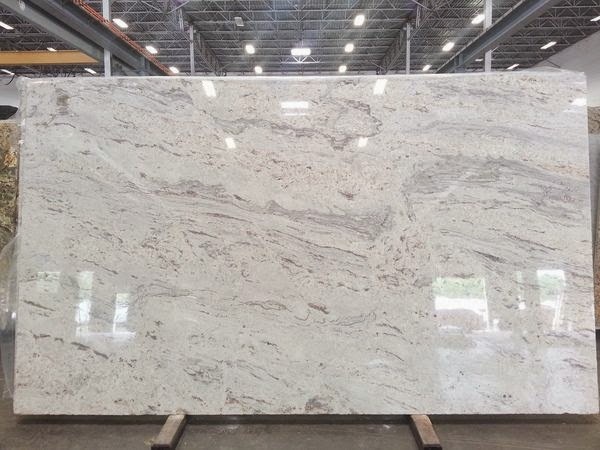 We are going to incorporate both greys and browns into the countertops and tile, so we can go either way, as the styles change. You're going to love it! I'm sure it's a difficult process but you're going to love it once it's done! I can't wait to see the finish product!! It looks so good already.. 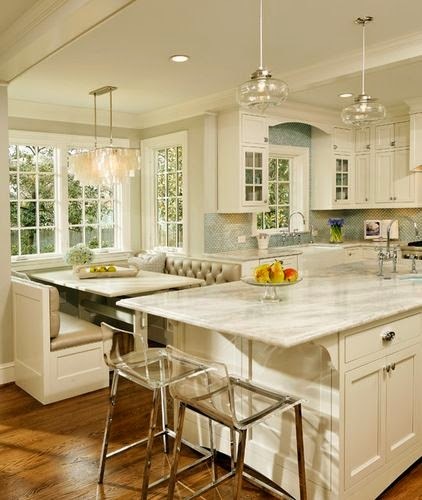 I am so in love with White kitchens right now :) Love it. Found your blog super cute.. I am a teacher too! What grade do you teach? It's already looking great!! I'm assuming you haven't changed the counter top yet? Love the ideas of the back splashes- especially the one that is the smaller tiles with the bits of brown and stuff- can't wait to see the finished product!! 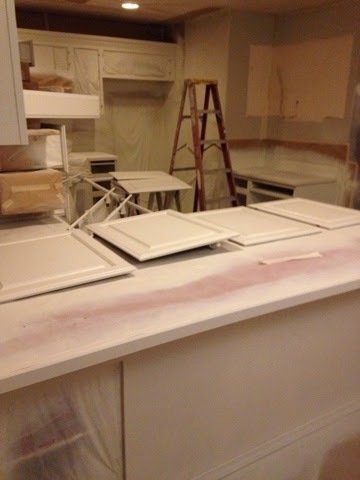 You are correct, we haven't done the countertops yet. 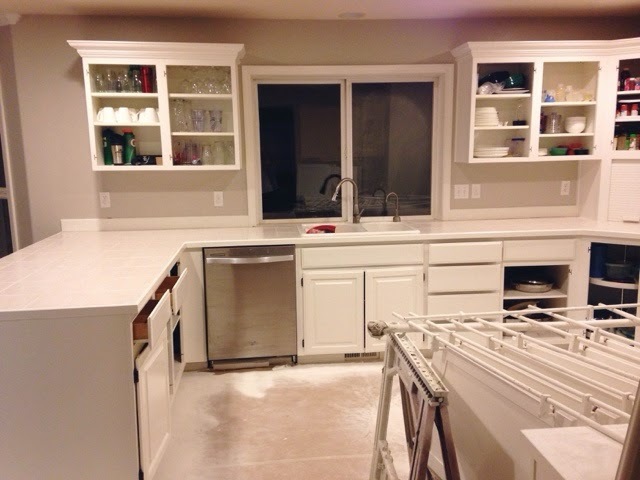 It's funny how much I use to hate them before we painted the cabinets. Now, I don't hate them nearly as much! 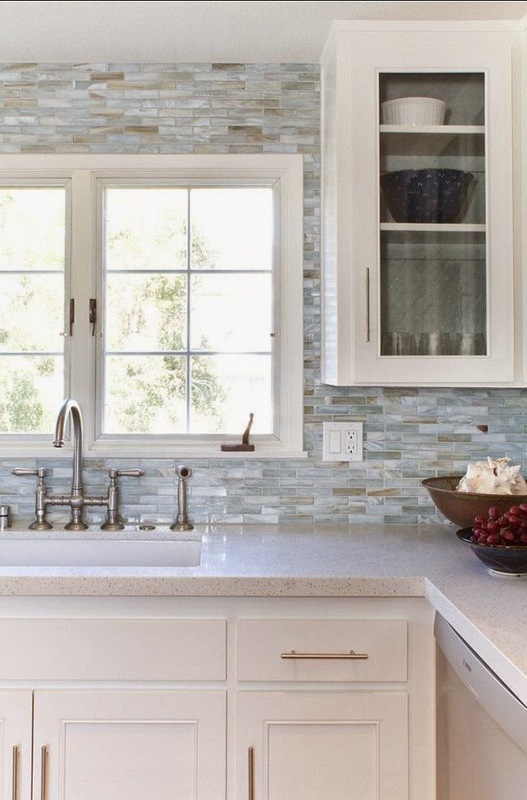 ;-) That's one of my favorite backsplashes, too! I will definitely post pictures of the final product! This is coming along so fabulously! Love it! It's so bright and gorgeous! I love the crown moulding! I want to add that to our cabinets. It's so easy and makes SUCH a difference! You should go for it!! 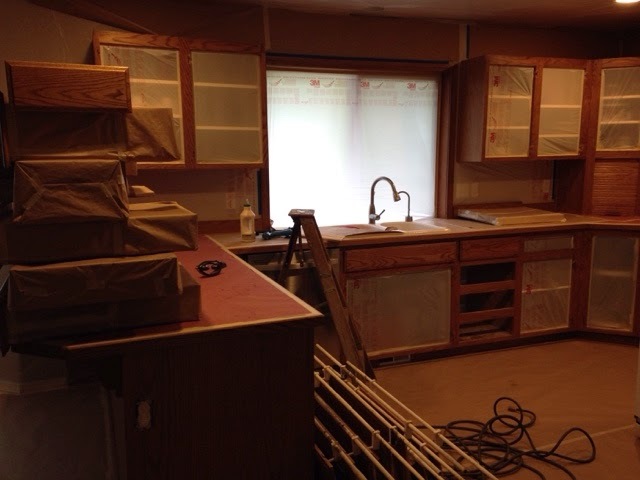 Your kitchen is coming along great! What a change...LOVE the all white! 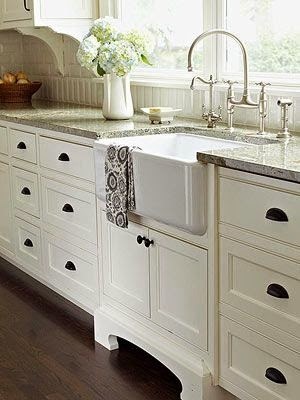 Love an apron sink (I think that's what it's called!?) Can;t wait to see the finished product!! That's what I'm thinking!! Sort of like a farmhouse sink, right? Thanks! It already looks great so far! 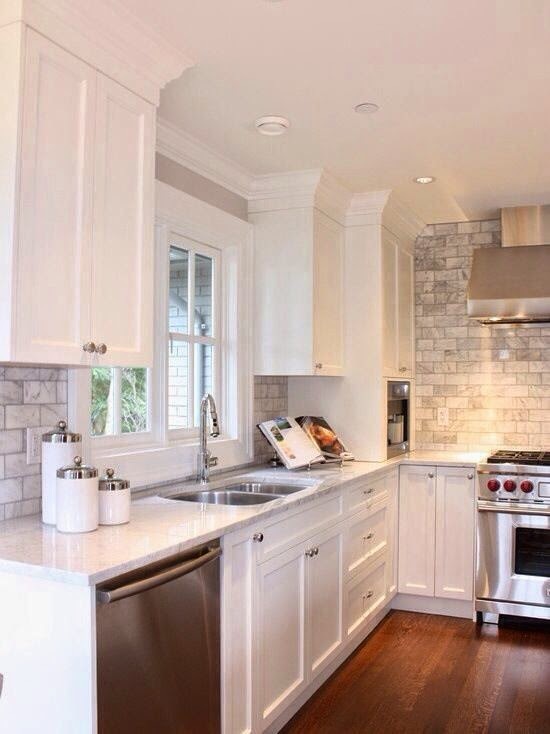 I love the white cabinets! 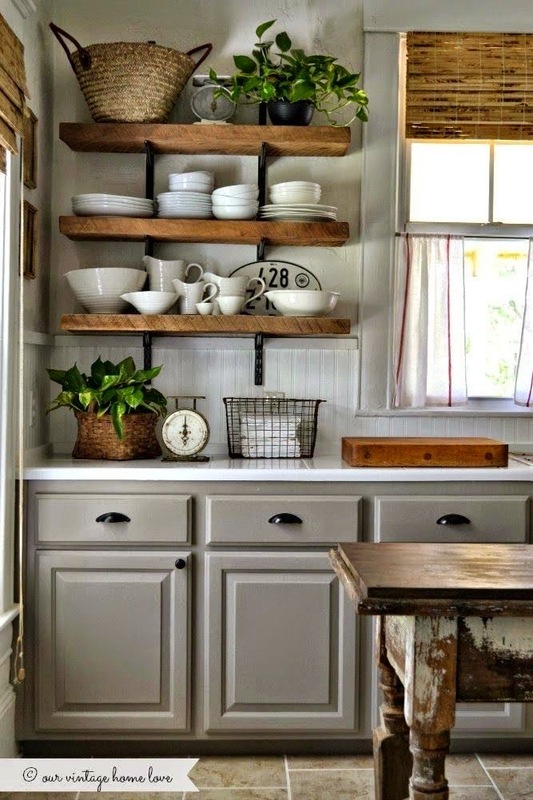 Love the darker wood shelves...they bring a touch of nature into the clean look!!! I'm thinking the same thing. Thank you! Looks great! Can you please tell me the beige/grey paint color on your walls? Thanks! It's Benjamin Moore's "Revere Pewter". And, thank you! 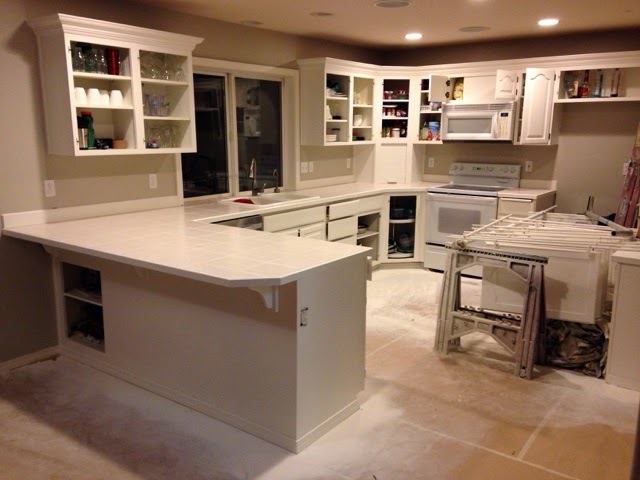 Your kitchen will be worth the wait! It will be gorgeous! Looks like it is going to be awesome! 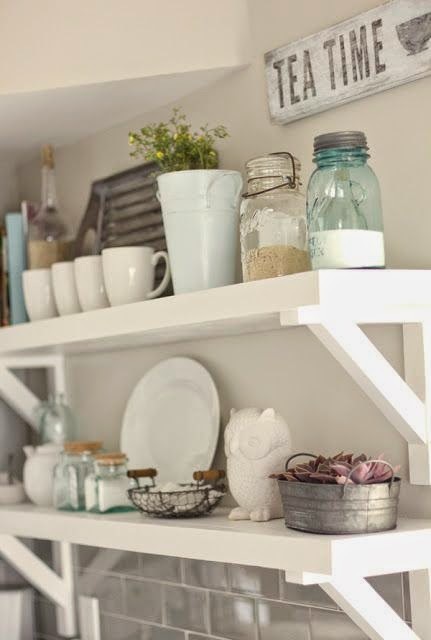 And I LOVE those shelves - definitely take the leap of faith because I think it will be worth it! Hi Kelly! 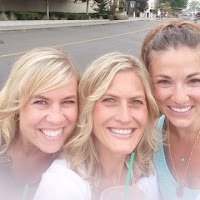 I just found your blog via Friday Favorites! WOW! I can't get over the transition and you're not even finished yet! I think it is going to look so awesome!! Have a great weekend!